RME Roofing specializes in insurance claim repairs, roof repairs, leaky roofs and anything weather-related that applies to your home. We specialize in roofs, aluminum siding, gutter replacement and other specialized home repairs. RME Roofing has been servicing the Denver Roofing Repair business for many years, and strives to provide the highest-level of customer satisfaction available. RME services are available on a per-customer, needed basis. Not all projects require roof repair, or siding replacement. Please be sure to have an RME Roofing professional inspection done to your home to determine the amount of damage that may have been done to your residence. A video testimonial from another satisfied RME Roofing customer. We appreciate the Barclay Family for their time, kind words, and overall, just being a great American family who trusted us to strive for perfection. Be sure to visit RME Roofing for all of your Denver Colorado Roofing repairs and replacement needs. 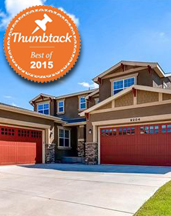 You can solidify your decision by visiting us at Thumbtack and reading our outstanding reviews. 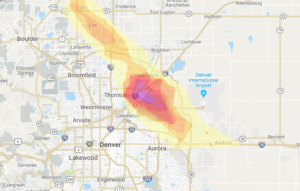 Claims began rolling in almost immediately after what some have termed a “hail bomb,” which pelted the south and northeastern parts of the city with tennis-ball-sized hail. Windows of cars and homes were smashed, vehicle hoods were dimpled, roofs were beaten, less durable property was shredded, plants and trees were ripped apart. 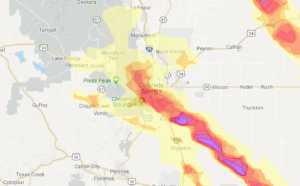 The Rocky Mountain Insurance Information Association isn’t ready to release figures estimating how much the storm cost in damage – that could come next week – but they “know it will be a significant event,” spokeswoman Carole Walker said. Companies are receiving a “flood of claims,” she said. While insurance companies designate “catastrophes” based on volume, the association gives the designation when weather events do more than $25 million in damage. 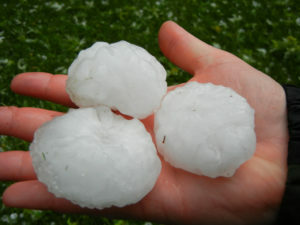 That figure can be easy to reach in Colorado, which is ranked second behind Texas for hail damage claims nationwide, Walker said. Based on the number of claims the area’s top insurance companies have reported, Colorado Springs is earning the ranking. USAA, which insures 11.5 million military members and their families nationwide, has processed 15,000 claims in Colorado Springs since Thursday, spokesman Richard Johnson said. Roughly 10,000 of them were auto claims, the rest by homeowners.